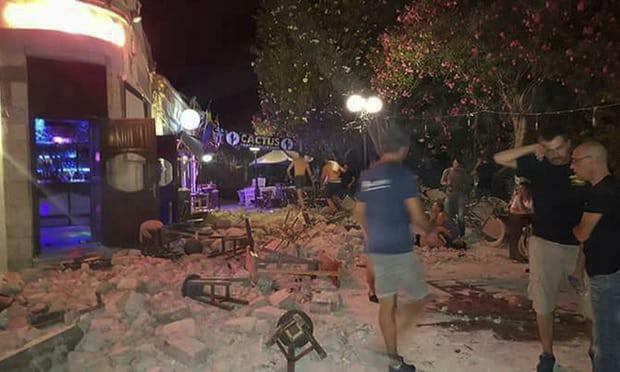 A powerful earthquake of magnitude 6.7 has killed at least two people on the island of Kos and injured 200 in Greek and Turkish coastal towns. The quake struck near major tourist destinations around the Aegean sea in the early hours of Friday, Turkish and Greek officials said. Around 200 people have been injured, officials said, with at least 120 on Kos and 70 in Turkey. The United States Geological Survey (USGS), which monitors earthquakes, said it was a very shallow quake – only 10km (6.2 miles) below the seabed – off the southwestern coastal city of Marmaris in the Mugla province. The epicentre was just 10km south of the Turkish resort of Bodrum and 16km east-northeast of Kos. The chairman of Turkey’s disaster and emergency management presidency (AFAD), Mehmet Halis Bilden, warned citizens about incoming aftershocks, but added there were no casualties or major damage in Turkey.